minuet of life: Hermes Birkin Crocodile Set On Fire: Brainy or Brainless Art? 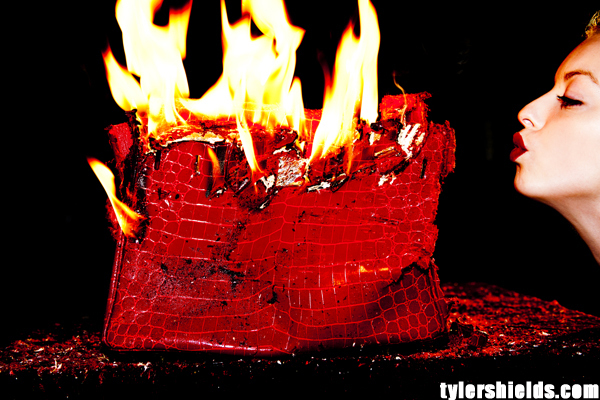 Hermes Birkin Crocodile Set On Fire: Brainy or Brainless Art? The so called Birkin art slash destruction slash publicity stunt. From Tyler Shields, featuring a "$100,000 Hermes Birkin Crocs" and his girlfriend Francesca Eastwood. Many people have shunned this pair for their silly attempt to advertise Eastwood's reality show. Many Hermes experts have also put their verdict on the pitiful bag- bitten, chewed on, chainsawed, burnt alive. But all in the name of a fake Birkin. Nice advertising, still. I don't care whether it's the real deal or not, but this shots definitely balloons up their name in the world of Hermes cult. Though maybe not in a positive light.